My dad is from a big Italian family. You know, one of those families that is always bustling: lots of people, lots of kids, lots of stories. Everyone is a star in our family, every birthday attended by 20 or so of your closest aunts, uncles, and cousins. And they remember your most important moments for years! Well, once I started cooking on my own, I realized that most of the recipes I cooked were, well, Italian! It's comforting for me, it reminds me of home. I made this recipe for my boyfriend because he loves crab. I love that it's a take on a family tradition, since I remember our family sitting around the kitchen table, stuffing shells for our dinner guests. Boil the shells in a boiling pot of salted water (about 12 minutes). When the shells are pliable, drain and rinse with cold water. This should make them cool enough to touch. 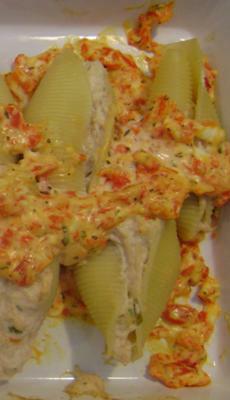 Combine crabmeat, ricotta, hot sauce, juice of 2 lemons, and 1/4 cup of Italian seasoning. Mix well. Combine remaining italian seasoning and diced tomatoes. Pour half on the bottom of a 9x13 ceramic pan. Stuff shells with approximately 1 tbsp. of crab mixture. Repeat until all shells are full. Put stuffed shells on top of tomatoes. Cover shells with remaining tomato mixture. Top with grated mozzarella cheese. Place in heated oven for 15-20 minutes until cheese starts to brown. Comments for Stoonad Stuffed Shells! Great twist on a classic! Very easy to make, and a hit with my dinner guests -- thanks, Danielle! Delicious variation on an old standard, and easy to make, too. Will be part of my standard dinner rotation. My absolute favorite and D is a very creative cook! This recipe was easy to make and was a hit with my kids. It wasn't bad but it's certainly nothing to get all giddy about. I just had it for lunch -- I don't think I'll be having it again. Nice try though. This tastes amazing once it's baked! What a different take on the usual stuffed shells...quick and easy too! I love this recipe. Simple steps with lots of flavor. I can't wait to make it for my family even though we aren't Italian! Made this for a quick and easy dinner tonight! Thanks for the recipe! I made this recipe and my family thought it was amazing! I will be adding to to our weekly meal plans! Sounds delicious - cannot wait to try it out!!! The recipe looks very tasty and easy to make. I'm going to try it at our next family get-together. Maybe we'll start a new tradition! Good luck!! Your recipe looks so good. Not too hard to make at all. Picked up all the ingredients to try it out. My kids loved it! I love this "crabby" twist on a tried-and-true favorite. I can't wait to try this recipe. It's easy but different enough that it's perfect to bring to my next potluck event. My family will love it too. Thanks. Seems easy enough to make and sounds delicious. Will definitely try it for my family.